If you know anything about me, you know that I love anything related to beauty and personal care! One thing that I pride myself on is the care of my face, and my lips are included! Especially during these cold winter months (even though it's in the 60s here in MD today! ), it is very important to keep lips healthy and hydrated! 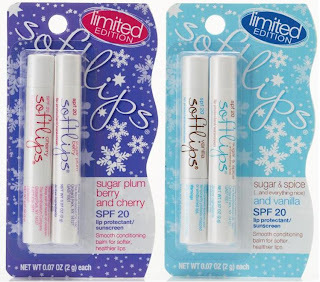 Softlips recently introduced it's limited edition winter flavors. Four great flavors with SPF 20: Sugar & Spice, Sugar Plum Berry, Winter Mint and Sugar Cookie. Yum! I've tried all of these flavors and I love how they feel and smell! Right now you can also go and enter the Softlips Picture Perfect Lips Contest – one winner will win $2500 cash and a supply of Softlips! One of you will win the four limited edition flavors I mentioned above! Be sure to leave a comment for every extra entry that you do! Fine print: This contest will end at midnight EST on 12/15/09. The winner will be announced here and emailed. Winner will have 48 hours to respond to my email with their shipping information, or they will forfeit their prize. I would love to try their rasberry:) Please enter me in your giveaway. Thanks!! I am also following through Google Connect. Also subscribed through RSS Feed. I'd love to try the Pure HoneyDew. My twitter name is @sohamolina. I also entered the Out of the Box Game Giveaway. I would love to try the Softlips Pure Honeydew! I really want to try their Pure pomegranate organic lip conditioner!! Sounds wonderful. Iwill definitely be buying the Organic Honeydew when I see it. I entered the Eden's Fanatasies GC giveaway. The pomegranate flavor sounds marvelous! I'd love to try the strawberry flavour. I'd love to try Softlips PURE Pomegranate :) *Thanks* for the giveaway! I'd like to try honeydew! The Pure honeydew organic lip conditioner sounds really yummy!! I added your Holiday Hoopla button! I entered the eden fantasy's giveaway! I would love to try the Vanilla (Vanilla is my favorite smell ever!) As well as the Cherry! What a fun contest! Thanks for the chance and Happy Holidays! I entered Holey Donuts $150 Cash and Donuts Giveaway. I'd love to try the cherry one. Thanks!